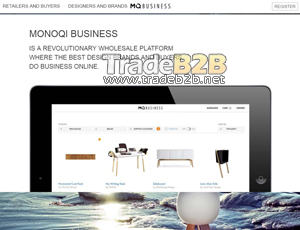 ‍MONOQIBUSINESS.com IS A REVOLUTIONARY WHOLESALE PLATFORM, WHERE THE BEST DESIGN BRANDS AND BUYERS DO BUSINESS ONLINE. About MONOQIBusiness.com - The B2B Marketplace for design's recommend,only on behalf of the views and opinions about B2B Directory, if you have any suggestions , please feel free to contact with us, we will amend and correct them in the first time according your suggestions. More better B2B Websites recomend, Please click here.